Let me state the obvious to anyone who has ever read my posts: I am not a chemist! If you are, and have more scientific information on what follows, don't be shy about commenting (I won't take offense). Escentric Molecules' latest creations, Molecule 041 and Escentric 042, are about the aroma chemical Javanol — a sandalwood-type molecule prepared from turpentine obtained from pine trees.3 Molecule 04 is "just" Javanol (diluted, of course); Escentric 04 is a more complex composition built around Javanol. I can't smell Javanol. Some problematic aroma chemicals will cause complete temporary anosmia, blocking my ability to smell anything for awhile (it feels as if two cold steel balls, about the size of golf balls, have been shoved up my nostrils; there's an immediate, and strange, sense of something being "shut down" or "closed off"). Javanol/Molecule 04 does not have this effect: I can't smell the Javanol, but I can still smell the bouquet of roses or cup of coffee next to my computer. Javanol, like some other sandalwood "substitutes," can't be smelled by a significant number of people. So far, only one person of the six people I've let sample Molecule 04 can smell it. While researching Javanol and its sandalwood-like brethren, I read that many of these molecules — Osyrol, Santaliff, Sandela — are difficult to detect or are "scentless" at certain concentrations. Perfumers sometimes get around this problem in the same way they do with musk aroma chemicals: by using more than one in a composition. I've read one can sometimes, with patience and daily application, "learn" to smell Javanol and its like (more on my Javanol experiment soon). I've also read that Javanol, if encountered too often, may end up being undetectable even by those who could initially smell it; Javanol can exhaust the nose. I found this personally hilarious: I'm training myself to smell something I won't be able to smell again! Javanol sounds interesting; it is described as a powerhouse, complex chemical. For the last month I've worn Molecule 04 every day. In week one, I could not smell anything but alcohol. Week two brought forth the scent of dust motes. After that came the scent of a toaster melting (hot metal and plastic) mixing with the dust. Finally, last week, I was able to smell the faintest of sandalwood aromas: a creamy sandalwood mixed with roses. I can smell this for less than a minute. I'm bored. I have delightful sandalwood perfumes I can smell. Molecule 04: I'm not your audience. I smell Escentric 04 just fine (at least, the non-Javanol bits). Escentric 04 goes on with strong and spicy grapefruit/bergamot; this accord is hard-edged (and I can detect the "melting toaster" aspect I also smelled in Molecule 04). The floral elements of Escentric 04 are blurred (with some mild rose, pervasive Hedione and sweet freesia). In its base, I detect Ambroxan, Iso E Super (another molecule that tires the nose) and a mix of notes that remind me of the scent of a pond in summer: a wet, grassy aroma mixing with mineral-rich/musky "water" — maybe that's the vetiver, Ambrox and cavorting beaver (castoreum). I enjoy Escentric 04 but wonder if I'm getting the entire "story." My Javanol experience makes me realize, more than ever, how much our perceptions of perfumes differ. How many things aren't I smelling that I should be? If there hadn't been a Molecule 04, I would've never known I was missing something in Escentric 04! If you can smell Molecule 04/Javanol, be a "guest contributor" for a day and give us all a mini-review in the comments section. I'll be sending my Molecule 04 and Escentric 04 to Robin Here at NST™; I can't wait to see if she can smell them. Escentric Molecules Escentric 04 and Molecule 04 Eaux de Toilette are $150 for 100 ml. For buying information, see the listing for Escentric Molecules under Perfume Houses. 2. Perfumer Geza Schoen; listed notes: pink grapefruit, bergamot, juniper berries, pink pepper, freesia, osmanthus, Hedione, orris, Javanol, rose, mastic, labdanum, musk, Iso E Super, Ambroxan, vetiver, castoreum. 3. Read more on Javanol creation and usage here. 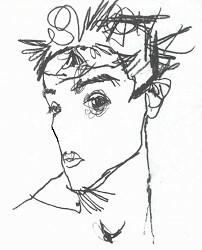 Note: middle image is Egon Schiele Self-Portrait (missing a nose) via Wikimedia Commons. I can’t smell *any* of the Molecule scents (ok, not true, I think I can sorta smell one of them briefly), so I can’t guest-contribute on the review. However, I did want to chime in to express my relief that I’m in such good, and extensive company not being able to smell them. These scents also made me keenly aware of all the scents in the world I might be experiencing completely differently/uniquely. It’s almost a wonder anyone has the courage to make scents using these aroma chemicals; I wouldn’t even know how to know if I were perceiving the smell correctly! Eleebelle, and Javanol is described as being used quite often. I’ve read in a few places that Javanol is one of the sandalwood substitutes now in Guerlain’s Samsara; the kind of thing that makes the scent noticeable at 50 paces. I don’t get the whole idea of molecular perfumes. Lucasai, can you smell Javanol? I think I did smell it once during some fragrance training at work as a concentrated oil. 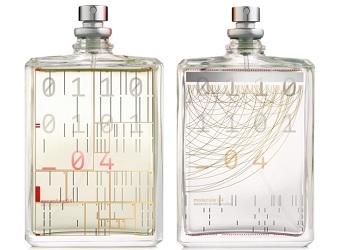 I didn’t try Molecule 04, that’s for sure. Very fun and interesting review! I’m just so confused though…why would aromachemicals be created for perfumes that most people can’t smell? Or that cause temporary anosmia? Gi, a perfume can still be ‘valid’ for lots of people, even with the troublesome aroma chemicals. I might have bought 30 ml of Escentric 04…even without being able to smell Javanol, I like it. I was being a bit facetious, but it does not seem like a great return on effort if only a small portion of people can actually smell the product. Then again, that does seem to be the aim of perfumes in a fragrance adverse culture: perfume that can’t be smelled! Pixel, and to me MKK is a little, kittenish musk! I attributed it to my perfume-eating skin more than my sniffer. I would love to do that Pixel, so I could understand better what I am smelling. Kevin, if you can’t smell a scent, what you can try is to spray something that you know you can underneath it (a scent you think will complement it). For example, I like to spray a new scent once to the upper chest and if it seems weak I can either spray more or spray a different scent a couple inches above the navel. Of course it helps if you can keep a couple of buttons on your shirt unbuttoned. Bigsly…I tried everything but putting Javanol in my mouth! Maybe tonight…. Lots of work for science here Kevin! What is your favorite sandalwood? Amy: no favorite but last winter I wore lots of TF Santal Blush, Bois 1920 Sandalo e The, Etro Sandalo and some sensational mysore sandalwood oil that a friend brought back from India…heavenly. Ha! A nose full of “cold steel balls” made me laugh in recognition. I feel anesthetized after smelling Baise Vole and Bvlgari Black and a few other perfumes. My sense of smell is severely tamped down for several days after sniffing them which is sad because I love both. I wondered if ionones or musks are to blame for the nasal shut down. Should I ever smell a blank space in a sandalwood composition it might be Javanol. I enjoyed skimming through the Perfumer’s Notes for Javanol. There are a number of perfumes with prominent sandalwood notes that I thought I would love but are ghastly nasty to my nose. Champs Elysees and a few other Guerlains come to mind. Hard to blame just one note though as there are so many sandalwood aromachemicals on the market. Thank you for the fascinating bit of perfume chemistry and food for thought. We all smell different(ly) to some degree. I’m interested enough that I may follow Pixel’s lead and investigate the Perfumer’s Apprentice Educational kits. So many chemicals to smell but such fun. Tiffanie: you’re welcome…and those kits sound fun. You have a great point, Kevin, that this demonstrates how different any perfume must smell to different people. This strikes me as a bit lonely for the perfumers, who must realize that no one else can ever appreciate their creations as they themselves do. FYI, I was reading about Iso E Super in Nez, the Olfactory Magazine. Iso E Super is derived from the reaction of two molecules. It’s not one molecule, however, but rather more than twenty different molecules, or isomers, that are produced during the manufacturing process. One of these constituent molecules, present in very small amounts, is responsible for most of the odor, and that one is referred to as Iso E Super Plus. Noz: interesting…and is Nez worth getting? Kevin, it’s $30 for 144 pages, very few ads, nearly all content (with illustrations), great articles by people like Jean-Claude Ellena, Celine Ellena, Denyse Beaulieu, and Angela Sanders, to name a few, on interesting topics. Not PR puff pieces, either, unlike many magazine and newspaper articles. Lively, thoughtful, informative, diverse angles. Yes, I think it’s well worth it and recommend it. I have been a long time reader/lurker, but I created an account to join in this discussion. I really loved this review! After reading so many comments about ambroxan, I decided to try Molecule 02 and also Juliette has a Gun’s Not a Perfume. On first spray, I like them both (and I continue to wear them), although I lean a little more toward Not a Perfume, which smells a little soapier to my nose. The funny thing is that minutes after I apply them, I can’t smell them at all. Other people can smell them and I’m frequently told I smell good, a little like vetiver, or like something clean. Yesterday a woman asked what the wonderful androgynous scent was I was wearing and students (I’m a high school teacher) frequently tell me I smell good. I have purchased ambroxan crystals from a perfume supplier and I CAN smell those with more regularity. I keep them in a little open-topped jar to scent the air in my home. Like BigslyFragrance suggested above, I often use these pure ambroxan fragrances as a base for other scents. Through that lens, I can feel how the ambroxan changes other scents. I particularly like to do this with more feminine and overt fragrances because my style tends toward the modern and minimal and I typically like androgynous scents. However, since I can’t smell the ambroxan for very long after it’s on, I have wondered how strong it is to other people. Hi, ScienceLady! I appreciate your perceptive comment, am glad you’ve signed on, and hope to hear more about your experiences with perfume. Your description of 02 is very similar to my experience of 01. I’d bet perfumers like these aromachemicals as much for their effect on other scents, as you describe. Molecule 03, the vetiver one, I can always smell, but there’s a sort of sweet facet to it that I find unpleasant. I prefer natural vetiver. I can’t smell 04, just a feeling that there’s something there on the periphery of my sensory range. I’ve tried 02 but can’t remember offhand. ScienceLady: welcome! So Ambrox exhausts you pretty quickly! I listened to some online comments re: Javanol and I often heard people say others would comment on their overapplication of perfume while they could hardly smell a thing. Kevin, thank you for the fascinating review. Not everyone understands Picasso, but it doesn’t mean he should be dismissed because the majority of the population doesn’t know how to appreciate him or understand the meaning of his paintings. This fragrance should captivate your imagination on the concept. Especially because it’s so complex with having an ingredient that’s not apparent to everyone’s nose. Their fragrances intrigue me. Fragrance shouldn’t always be something that’s up front and gives it all away first sniff/test. Jovejove, but isn’t that like telling a blind person, “Picasso is great, believe me.” I’m not dissing this Escentric Molecules concept…but I am not captivated by something I can’t smell. For most people that are on the blog, fragrance is an art, it’s a passion and love for them. For those that it’s a one night sniff of gratification, they don’t know how to appreciate it and learn to love it for its face value. Even a blind person can appreciate a Picasso. I adore sandalwood. But in this case I was disappointed. No. Without many words. For me it’s just a big no. Jaisalmer…thank goodness there are more options than Javanol! Smelling Molecule 04 was, for lack of a better term, a mind f*** for me. I had read that some people found it offensive and that it lasts forever and when I smelled it, I got nothing. I felt like I had discovered there was a color others could see that I couldn’t!! It made me wonder if I was smelling the same things as anyone else? *Perhaps* my sense of smell is a little more important to me than a lot of people, but it really bothered me! It’s one thing to get used to something and stop smelling it, but to have something others have said smells for miles and I get nothing? Blew my mind in the worst way. The whole episode was actually rather upsetting! Katrina…ah, at least your children didn’t inherit your defective genes! (Just kidding). I’m betting we are not missing out on something fabulous…if I lost my ability to smell real sndalwood I ‘d be upset.